My mother’s banana bread is pretty perfect just the way it is. 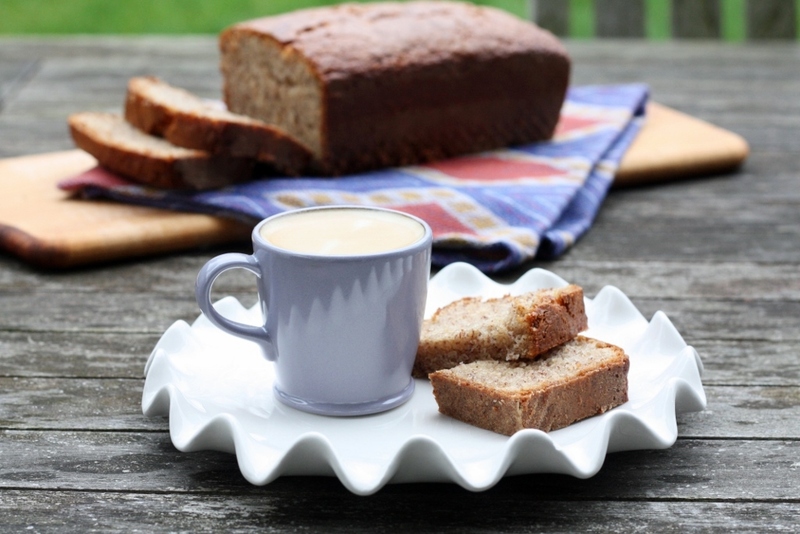 It is just about the only recipe that I never mess with – I have tried other banana bread recipes, but none compare. The only experimenting I have done over the years is to create a non-dairy version that my husband can enjoy. Coconut milk makes a wonderful substitution from the buttermilk that normally I use. This month I received some delicious products from Woodstock Foods to try – and for some reason when I dipped my spoon into the delicious almond butter – it was the banana bread that I couldn’t stop thinking about. What if I added almond butter to the mix…would magic happen? Well, I think it was the combination of Stonyfield Farm’s Grass Fed Yogurt with the Almond Butter that really sparked something. This was one of the best batches I have ever made. But seriously, with this recipe, have I ever made a bad batch? These loaves came out a little more tender, and the almond butter just gave it a little richer flavor. Success all around – particularly for my kids who now have a special treat for breakfast all week. Pre-heat oven to 350. Mash bananas with a fork and set aside. Mix oil, sugar, yogurt, vanilla, almond butter and eggs well. Add mashed bananas. Mix dry ingredients in a small bowl, and add to banana mixture until just combined well. Pour into 2 greased and floured 9 x 5″ loaf pans. Bake for 45-50 minutes, or until a toothpick inserted in the middle comes out clean. Remove from pans while still warm and wrap with plastic. Please note: As a Team Stonyfield ambassador, I am being compensated. All opinions about Stonyfield Farm’s products and Woodstock Foods are always my own.